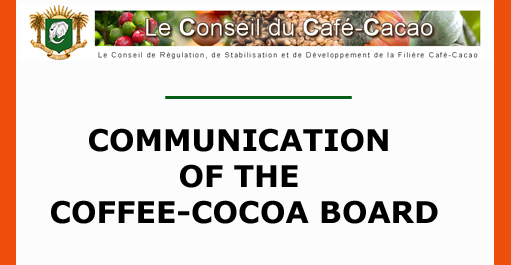 COMMUNICATION OF THE COFFEE-COCOA BOARD AS PART OF ITS INFORMATIVE AND AWARENESS TOUR IN COFFEE AND COCOA GROWING AREAS . Establishing strong inter-professional bodies supported by credible farmer Associations. Maintaining our position as world leader for the production of cocoa through actions to improve productivity and quality. Supporting the strengthening of agricultural research and dissemination. Participation into the nation 2012-2014 action plan to combat child trafficking, exploitation and labor. Strengthening and improving the implementation of socio‐economic infrastructures through the rural areas investment fund (Fonds d’Investissements en Milieu Rural ‐FIMR). The Coffee and Cocoa Board has set up a coherent framework to manage the physical flow of the internal marketing to ensure compliance with the admitted prices and quality. oThe quality of the product. 9.The transport of the product from the purchase areas to the exporter warehouses and factories shall be supported by a document called "bill of lading." The cost of product transport from the purchase areas to the ports shall be integrated into the schedule of guaranteed price so that each operator manages its own equalization. In that respect, the Coffee and Cocoa Board has scheduled meetings with cooperatives and processors. - Poor quality shall be directly sent to manufacturing factories and a discount may be provided at the expense of the product’s owner. The number of regional delegations of the coffee-cocoa Board in producing areas will be 13. Coffee and cocoa Board departments will be located in the following districts: Abengourou, Abidjan, Aboisso Adzopé/Agboville, Bongouanou, Daloa, Duékoué, Gagnoa, Man, San Pedro, Soubré and Yamoussoukro. Producers will therefore retain purchase receipts issued to them by buyers. 7.Fraudulent transactions will be exposed. Starting from the forthcoming crop year, the Government pledges to set a guaranteed price to producers. This price will be fixed twice per crop year: you will have a price for the main agricultural season and another one for the secondary agricultural season. This price will be at least equal to 60% of the average CIF price (international price) proceeding from the new external marketing system. Even in the event of a drop in international prices, the producer price shall not be less than 50% of the CIF price. 5. Product shipment (CIF Value, FCFA/Kg). The development of the differential will be done jointly with operators and will be updated at the start of the crop year 2012/2013. Quality is one of the major issues of the cocoa sector in Côte d'Ivoire. Since the liberalization of the sector, it was found that cocoa quality was continuously deteriorated at all stages of the marketing chain. This resulted in lower incomes in producers and their organizations because of high levels of reimbursement made by exporters and the loss of government revenue. Considering the behavior of players in the field, you find out that buyers and trackers pick ungraded products, routinely conduct mixtures, and finally deliver very-average-quality or even sub-standard products to exporters. Producers and cooperatives are also highly liable for the deterioration in the quality obtained at farm gate especially in terms of pre-and-post-harvest practices that constitute the starting point of quality approach. Players in the field should understand that the requirements of consumer countries in terms of quality are becoming stronger as shown by the large number of laws adopted by the European Union. - Finally, avoid storing cocoa on the floor. Our parents who are farmers are therefore required to give utmost consideration to quality matters; otherwise no one will purchase their products. As for buyers, it is strictly forbidden to practice price reductions on the producer price. Any buyer failing to abide by the settlement of the price guaranteed to producers will be punished. The penalty can range from temporary suspension of its authorization to its outright withdrawal. Bush bags are meant for to private producers, cooperatives, and contractors according to their collection capacity and product delivery rates. The residual stocks of bags per store will be updated regularly to replenish depending on the smooth run of the activity. At port areas in Abidjan and San Pedro, the Coffee and Cocoa Board will ensure that exporters give back the equivalent number of empty bags during each delivery of products via inspections. The strategy employed so far needs to be improved to reach out the largest number of producers. Thus, the CNRA will have to enlarge and bring closer the seed fields of production areas. The Government wants the active participation of producers and their organizations in the management of the sector. To this end, it is important to make these organizations workable. The Ministry of Agriculture is conducting discussions with private partners to finance cooperatives. The census was completed producers. What’s left to be done is to validate the results. This step is to showcase the results in different areas of production of coffee and cocoa by requesting validation from the producers and their communities. After this process, the business cards that will be used to organize elections for the representation of producers will be issued to them. The identification and evaluation of cooperatives are needed to better target support to be provided to cooperatives. A preliminary survey conducted in January 2012 by the Offices of the Ministry of Agriculture and the Coffee and Cocoa Board accounted for a total of 2,015 cooperatives existing in the coffee and cocoa sector. The evaluation of cooperatives will therefore be made on this basis. - The certification of accounts by authorized auditors. - Improve quality at entry through the strengthening of ANADER’s efforts to provide better support for producers through awareness, information and training. On Swollen shoot disease, the sector funded the CNRA to make research on control methods against this disease. A guidebook has just been made available to ANADER to educate and train farmers on these methods. To meet the challenges of sustainable cocoa economy, address the lack of synergy and capitalize all private or public initiatives implemented in the field and to optimize the resources available to the communities in cocoa- producing areas, the platform of public-private partnership will be implemented soon. Thus, continuous dialogue will be established between all stakeholders in the cocoa sector to better coordinate efforts and initiatives to promote a sustainable cocoa and coffee economy. Cocoa certification is based on the principles of traceability and respect of economic, social and environmental sustainability. It aims to improve the living standards of farmers and their communities, while meeting the demands of consumers. It is in this context that in recent years, certification projects were developed in cocoa producing areas in Côte d’Ivoire on the private sector’s initiative (chocolate makers, exporters, NGOs, etc..). In order to take corrective action to address the numerous issues which arose from lack of coordination including as well the non-payment of certification premiums to producers, the Coffee and Cocoa Board decided to focus on coordination and monitoring of these projects in cooperation with stakeholders to safeguard the interests of producers and their communities. - The construction of health centers and provision of essential drugs to health centers, health districts and to teaching hospitals. – The ability to have physical products observing qualitatively and quantitatively the contractual terms. - The unfreezing price is lower than the price reference on a CIF basis and the gap between these prices is called support and shall be paid by the Coffee and Cocoa Board to the exporter. Promoting local and regional consumption products of coffee and cocoa through communication campaigns (including the benefits of consumption of products) and promotional campaigns. Conducting a study on the benefits for the single export tax (DUS) granted by the State to processors, to guide the industrial promotion policy. Improvement of the cooperative movements operating in the sector through the identification and evaluation of these cooperatives. to lay the foundations for sustainable production. to improve the Ivorian label. to boost confidence in the private sector, secure and increase return on investment in the sector.